BEIJING, Feb. 15 (Xinhua) -- Chinese President Xi Jinping on Friday met with U.S. Trade Representative Robert Lighthizer and Treasury Secretary Steven Mnuchin, who were here for a new round of China-U.S. high-level economic and trade consultations, at the Great Hall of the People in Beijing, saying "important progress for the current stage" was made after the two-day talks. It serves both peoples' fundamental interests and meets the expectations of the international community to maintain sound and stable development of China-U.S. ties, Xi said. "I hope that both teams will strengthen communication, focus on cooperation and manage differences in the principles and directions set by President Trump and I, so as to promote the sound and stable development of China-U.S. economic and trade cooperation and bilateral ties," Xi said. "I have repeatedly said that China and the United States cannot be separated from one another. Only through cooperation can a win-win situation be attained, and confrontation will certainly lead to a lose-lose scenario," Xi said, adding that "cooperation is the best choice for both sides." "Of course, there are principles in cooperation," he added. 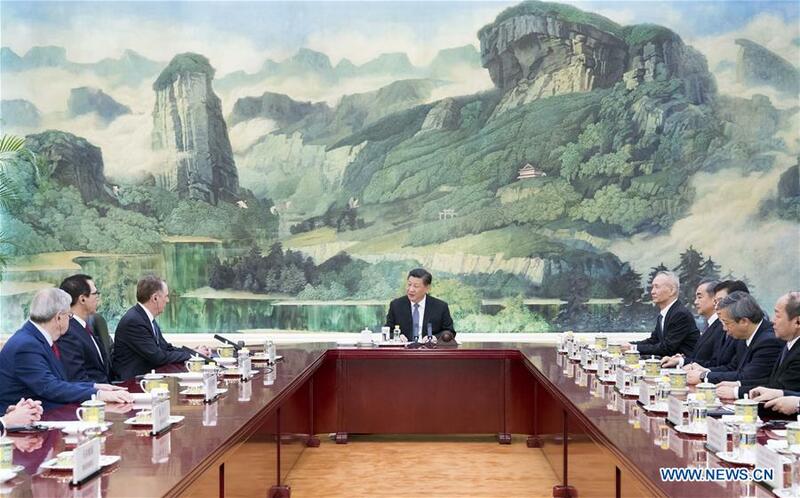 Noting that the eyes of the world have been on Beijing these past two days, Xi said the two sides "have again achieved important progress for the current stage." "Both sides will meet again next week in Washington. I hope you all will make persistent efforts and try to reach a mutually beneficial agreement," the president said.